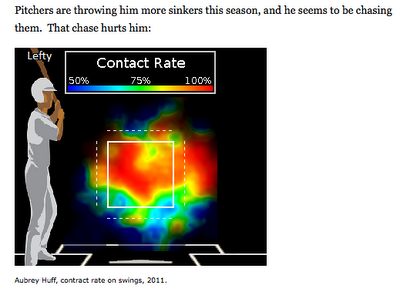 A recent article in Sports Illustrated analyzed a pitch called the cut fastball. Included in the article were funky "heat" graphs that depicted the difficulty hitters are having in hitting the increasingly popular and nasty pitch. Nice comment,Bill! Weather and baseball are always linked at the hip. With Target Field now open it brings back the weather and the Twins to how it should be. Yeah, not knowing there will be a game each and every night due to rain is really a good thing... sure makes me want to drive an hour and a half in questionable weather just to have to come back some other day.